Another gem in the Japan-inspired themed scarves, the Daimyo is an impactful yet gracious scarf depicting samurai swords entertwined with the leaf motif (the symbol of Tokyo). "Daimyo" (from "dai" - "large" - and "myō" - short for myōden, meaning "private land") is a generic term referring to the powerful territorial lords in feudal Japan (the period, also referred to as "premodern", that spans from the 10th century to the early 19th century) who ruled most of the country from their vast, hereditary land holdings; they were the most powerful rulers after the "Shogun" (military rank and historical title for Hereditary Commanders-in-Chief of the Armed Forces of Japan, the equivalent of today's "Generalissimo"). "Soleil Levant" ("Rising Sun") is another name for Japan, something I, too, was fortunate to discover upon living there - the impact is particularly felt during the first days in the country, when my sleeping patterns were off relative to the rhythm of life there and in addition, the birds started chirping outside my window at 4am for the sun was already high up in the sky). 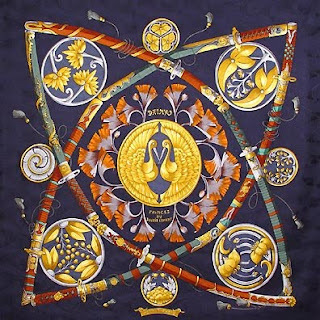 So the title of the scarf "Daimyo, Princes of the Rising Sun" is a gracious name that sets the tone for the entire feel of the scarf: swords, their symbols, are skillfully depicted with various insignia of the powerful lord clans. In the center, the gingko leaves (from a ubiquitous Japanese tree and the symbol of Metropolitan Tokyo) surround two cranes - another symbol of Japan - in a very harmonious circle. Finally, the regal look of this scarf is also impressed by the jacquard silk, the fabric that has a pattern (also of gingko leaves) weaved in it. This scarf is one of the most beloved Hermes productions, a highly collectible scarf and a sought-after design in any sale or auction around the world, particularly since the material is no longer utilized by Hermes due to the excessive costs of production. I was spending my summer in Japan in 2007 when Hermes announced, with great fanfare, the launch of its 70cm carre. Of course the news was received overwhelmingly well and with a great deal of enthusiasm, despite the existing availability of such scarves for many years. The collection is entitled "Vintage" and the scarves display either a vintage appearance, or vintage colours (or both), to endorse the title. 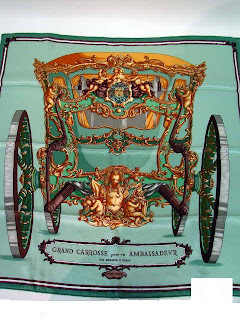 One model that appealed to me was "Grand Carrosse pour un Ambassadeur" ("Great Carriage for an Ambassador"), albeit not in all colours. The golden decorations against the vintage green makes for a very impactful effect, and this is the only colour combination that I found desirable - for my liking, of course. This is the first scarf design that I remember coming across, as a younger adult, and by the time I could afford one, many years later, the actual scarf was no longer available, so needless to say that while I don't possess one (yet? ), I still find it splendid and simply spectacular - the richness of the design carries me to the Andalusian hills and the fascination of everything beautiful that Spain has to offer - above all, the vivacious spirit. I love the sensation, felt by the admirer, to be on a patio, likely at the cover of the shade, gazing beyond the supporting columns to admire the landscape - possibly orchards, the surrounding hills and the stream of water. I also love the fruit - pomegranates and lemons - that bring so much colour and life to the design. Under normal circumstances, I would have considered this pattern too busy, but there's something about it - perhaps the harmony between the apparent fruit basket in contrast with the geometric pattern along the edge (reminiscent of the Maurish architectural influences), or just the colour combination - that makes it very rich, very voluptuous, very passionate.... and so elegant ! A definite statement of absolute sophistication ! One of the most striking designs I have ever come across, "Belles du Mexique" ("the Beauties of Mexico") is yet another ode to the effervescence of the Mexican culture, as so vivaciously expressed by the fiestas. 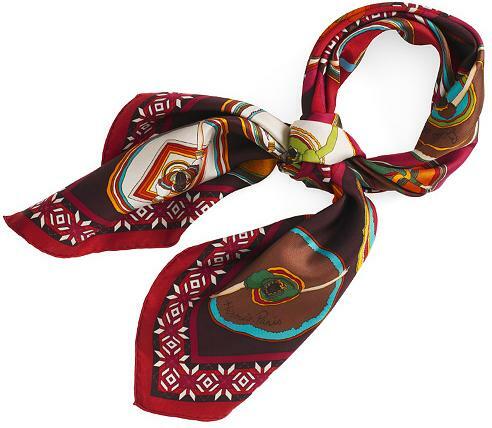 Indeed, this scarf is a celebration of the serenading music, dynamic dancing, rich display of costumes and of the Mexican people (in here, predominantly women) who feast the eyes of the admirers with their skills and beauty. 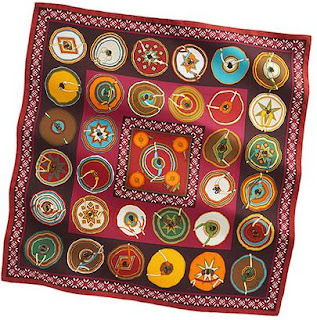 A first glance suggests circles lined up along the scarf edges in orderly fashion; yet, on closer inspection, we recognize that every apparent "circle" depicts, in fact, a Mexican dancer's dress, in full swirling motion. The focal point of the scarf depicts - perhaps - THE most beautiful dancer, surrounded by four Mexican gents serenading her. The border is made up of a geometric pattern that adds a harmonious balance to this otherwise playful and very dynamic design. The careful use of colours adds dynamism and playfullness as well. By far one of my most favourite designs, this scarf is a true fiesta for anyone wearing it, traditionally, around the neck, on the shoulders or as a waistband. You are sure to turn heads ! 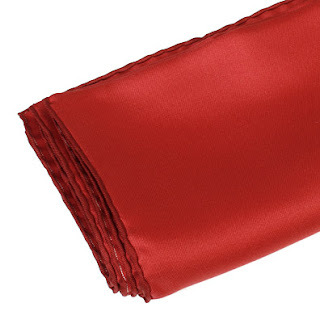 I came across this wonderful scarf just by chance, and was immediately taken by the rich background colour, discribed as "brick red". It is intense, without being too bright or over-the-top, and definitely exuding sophisticated elegance. Quite charming ! 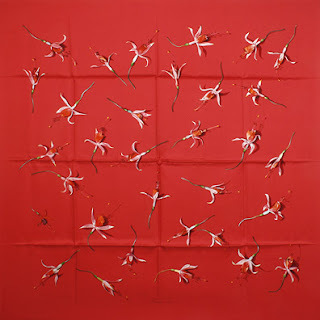 The pattern, on the other hand, was again very appealing because of the delicate flowers, depicted with their shadows, that give both depth and the impression of real flowers dispersed on the scarf. 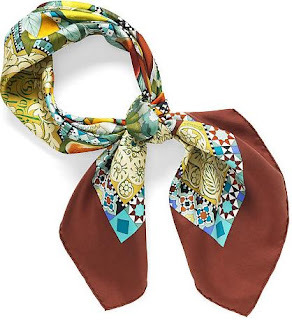 A testament of definite refinement and elegance both for the designer and for person who'll sport the scarf !